I realised I haven't been updating this blog as much recently. Life has been a lot busier been keeping me occupied with work, as well as building a network of social connections here in Sydney. One of the sites I would recommend but very under-utilised online sites is www.meetup.com. Even back in KL before I made my journey to Sydney, I was already participating in activities with both Facebook group, Likemind. This group is heralded by one of my mates, Remus Chong. They generally join up with one of the other Meetup groups when organising events. Recently I made a number of new mates from the Sydney based Meetup groups, which was an eye opener. Anyways, majority of my mates are still mostly Asians, due to shared interests and values. But what I really want to write about in this post is this link to Mark's Daily Apple. 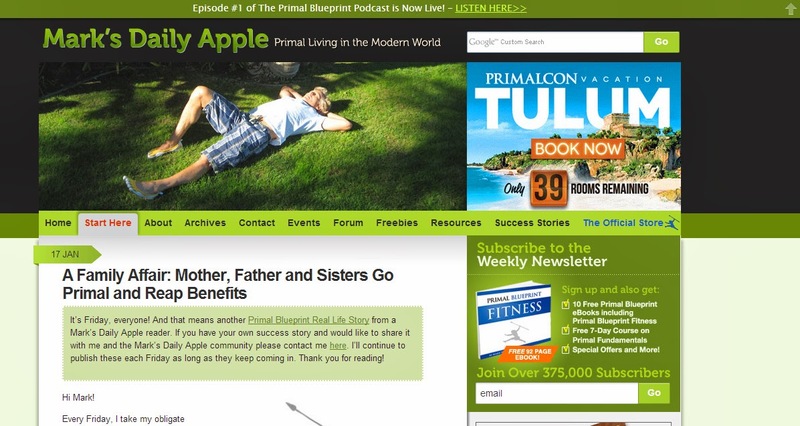 Mark owns a website The Primal Blueprint, where he is managing a Paleo dietary eating plan website. He is formerly a professional athlete, and has started a blog where he encourages readers to go on a high protein, low carbohydrate diet. What I find comforting about this eating plan is I understand that carbohydrates, starches and sugar are essentially glucose, or sugar at its most basic level. For a person with PCOS who needs to manage her insulin resistance and blood sugars, going on a low carb diet is necessary to evacuate all the dangers that carbohydrate brings to someone with a blood sugar problem. I've since started on this eating plan in the last two weeks. Starting on it was not the easiest thing ever, as my housemates were pretty appalled at the fact that I did not want to take any kinds of breads (white, or wholemeal! ), was cutting down on fresh cow's milk (i'm allergic to lactose sugar), and cutting down on soy milk as well. I'm still able to take hard tofu, tempeh, hard cheese, and small portions of yoghurt though. It's been two weeks since, and I think that they have accepted that it would be my eating plan from now onwards.. The new foods I've added to my diet include eggs, chicken, beef, sunflower seeds, salads, tuna. The most challenging thing about working with protein is finding ways to be creative to make these foods look and taste good and appetizing at the same time. I'm still on a 30% of carb ratio for my meals, being mostly rice or rice products. The way I see it, rice is a lot more safer than noodles as no additives or preservatives have been added to change its chemical properties. Given a choice between boiled potato salad with mayo dressing, boiled rice, and white bread, I would pick the potato salad (hopefully without the dressing), and rice, but not the white bread (with all its additives and preservatives). Well, we'll see it goes... will report it within the next two weeks of my eating plan progress so far.